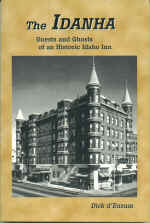 Description: The Idanha Hotel is one of the most famous inns in Idaho. Its lobby and rooms bubble with history. Its guest list reads like a who's who of the twentieth century. Sally Rand waved her fans in a hallway and Walter Johnson warmed up his pitching arm. Ethel Barrymore enjoyed its hospitality. British royalty supped at its table. Clarence Darrow prepared one of his most famous cases there. An assassin rigged a bomb under one of its beds. A century after its grand opening, the Idanha remains one of Boise, Idaho's most famous landmarks. 6 x 9, paperback, 222 pages, photographs.